To start off the week I would like to share a video I finished on Saturday but totally forgot to post it here. lol!! Ooops!! Don’t forget to scroll to the bottom to see an AMAZING Giveaway for this week!!!! Episode 671 – Happiness Surrounds Nugget Party Favor! This Week’s Pink Candy is Amazing! Finally had time to watch the video, so stinkin’ cute! That Nuggets packing is almost too cute to open and I love the colors you used! 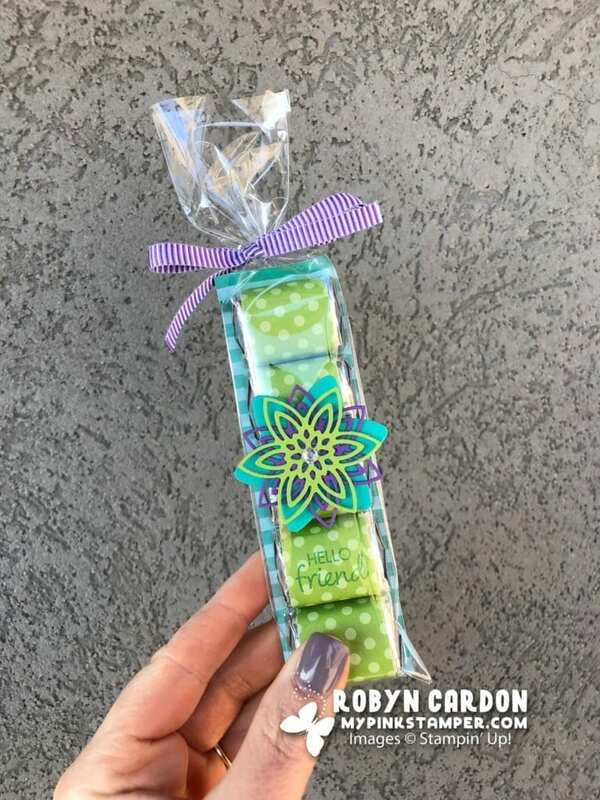 Thank you for a great way to present a sweet treat and for this fun giveaway..love the frogs! I would not have thought to use these colors together, but I like them. Happy Thanksgiving! 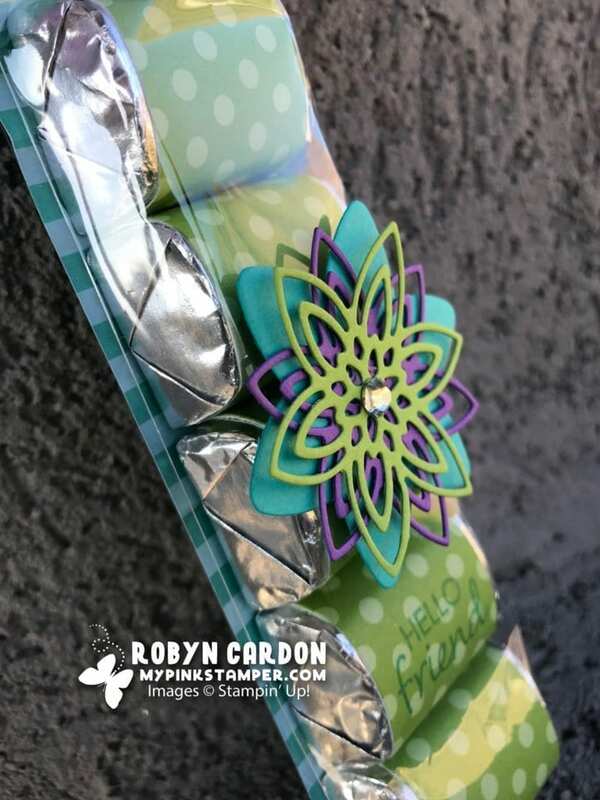 love the treat bags, I especially love the bright colors and the intricate dies! I love Stampin up!! I love those treat bags Robyn! They are so pretty. As always such a cute project. Love your creations. I can’t wait to work on my Hershey treats!! Hopefully I will get to them really soon 😉!! I absolutely love this froggy stamp set…I can’t wait to see all of the creative ideas everyone has for this one!! You can never go wrong with chocolate treats. What a fun treat-love the idea and colors! And the froggies are too cute! a card with them. Thanks for all you do !! Gorgeous! Can’t wait to get my Froggy set! Thanks for all you do! I love the candy treats. What a special little gift. These frogs are so adorbs!!! Sale-a-bration!!! Can’t wait!!! Cute treat bags. Love the frogs! Thanks for the inspiration. 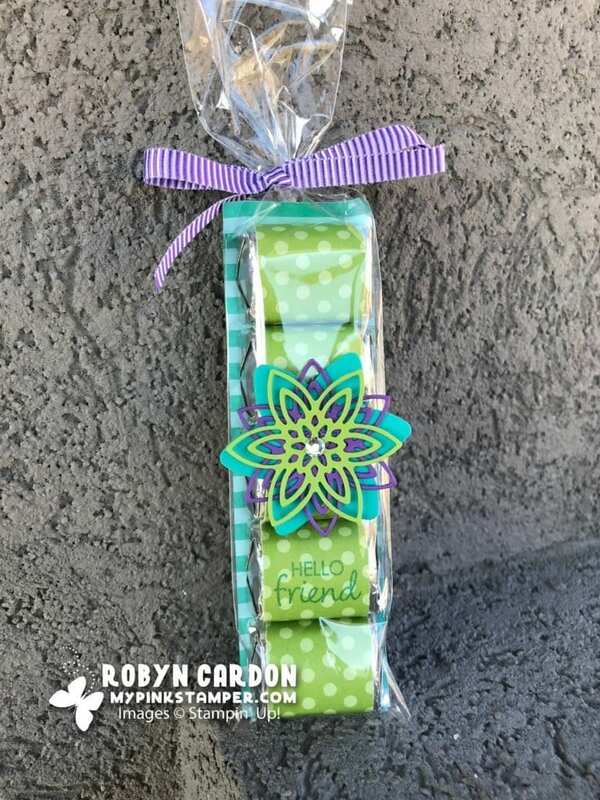 Love the treat holder, especially the colors. All go so well together. The stamp set just makes you “Hoppy” when you see it. So cute. Lovin the froggies! I love these little Hershey Nugget treats – so simple and cute. The colors you picked are great. Love the froggies and your nuggets!! The frog is soooo cute! Super cute little treats (but you had me at chocolate!). What a great gift idea! I will be doing it for sure. Thank you for sharing. Love the color combo. So pretty and bright. The hoppy stamp set is adorable! Love your nugget party favors! Fun color combo! Thanks for the chance to win the cute So Hoppy Together set! Love the color combo on the nuggets! Those colors are great together…..I would not have thought about putting them together. Thanks for sharing. Cute little frogs! Love the nuggets idea, too! Love those frogs!! The Chocolate Nugget Treats Favors are super cute!! Hershey nuggets have never failed me yet for favors, little side gifts etc. Happy thanksgiving and thanks for always keeping me inspired!!! Love the stamp set and framelits! Can’t look at that stamp set and not giggle!! How funny! Have a great week!! I heard about all the comedy surrounding this stamp set. SO FUNNY! Also, those treat bags are SO CUTE!!! I was just telling my husband this would be my little treats to pass out at our offices this year for Christmas. Your so very kind! Hope your Thanksgiving is wonderful!